As the election fast approaches and the Eastern Seaboard is bombarded by a mega-storm that is a rare combination of a Nor’easter and a hurricane, Republicans, desperate to regain power, are up to their usual tactics to try to sway voters their way. The usual libel, slander, racist and biblical pronouncements are given excessive coverage given their frivolity. Last week’s Trump pronouncement offering a reward in exchange for President Obama’s passport application and college transcripts received undue media attention, as if anything this bloviating egomaniac says is relevant or pertinent to any facts. Distraction is the name of the game, and the GOP wants anything to distract us from Willard Romney’s inability to stick to a real position, his Mormon Cult or his reluctance to release his Olympic records, Massachusetts governance records or his much coveted tax returns. With the looming storm, FEMA is front and center for providing disaster relief and has worked reasonably well when not mismanaged by an unconcerned GOP administration as it was during Katrina. Romney’s position on FEMA is pretty clear: privatize it for profit. During a 2011 GOP primary debate he (Romney) said it was “immoral” for the federal government to be spending money on disaster relief when it should be focused on deficit reduction: “Every time you have an occasion to take something from the federal government and send it back to the states, that’s the right direction. And if you can go even further, and send it back to the private sector, that’s even better. Instead of thinking, in the federal budget, what we should cut, we should ask the opposite question, what should we keep?” Essentially, Romney would do to disaster zones what Enron did to the power grid in California in 2002. If history is any indicator, Willard will most likely flip flop on his FEMA position, but make no mistake, if he wins, hurricane victims will be considered the 47% of Americans who do not concern him. Naturally, the bible-thumping fundamentalists don’t want to be left out of this opportunity to preach their hateful agenda. This hurricane is caused, naturally, by God’s displeasure with the support for gay marriage by those liberals in the White House. Seriously, this is exactly what Defend and Proclaim the Faith ministries founder John McTernan is asserting. Hurricane Sandy is proof that “God is systematically destroying America.” He continues, “If you add the area of the drought and now the hurricane together, it would be about 80 percent of the country!” … “As I said, the Holy God of Israel is systematically destroying America right before our eyes.” Doesn’t it make you wonder why God has singled out the entire East Coast for this storm when there are so many God-fearing Christians there? Is God really this vindictive? I remember how the November 2,2010 Teaparty victories were so heralded as a “grassroots” victory for frustrated Americans tired of the business-as-usual Washington D.C. politics. These victories brought us the 112th Congress, you know, the Congress that has given America record filibusters and anti-abortion legislation. It was exactly what Nate Silver of FiveThirtyEight.com predicted. He is a numbers guy, a master of prediction based on precise mathematics, formulated by a reliable dissection of myriad polling data. Since he has predicted a higher likelihood that President Obama will be victorious over Romney this election day, the right-wing media has naturally tried to discredit Mr. Silver by labeling him effeminate and gay. If you hate the facts, attack the messenger. That’s not a childish way to handle the truth at all! Naturally any Obama supporter who is a Republican feels a certain way for all the wrong reasons. 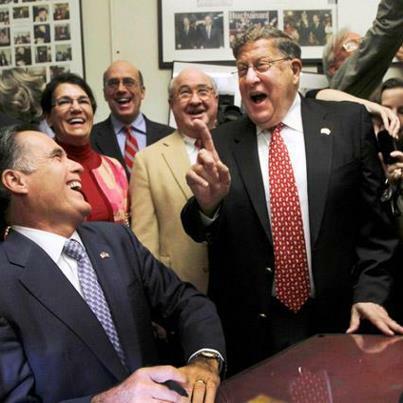 Just ask John Sununu. 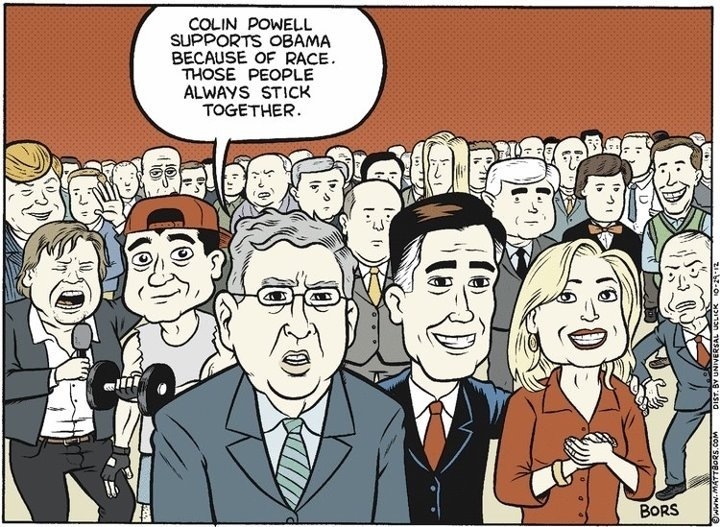 The former New Hampshire GOP Governor said in an interview the only reason former Secretary of State Colin Powell would endorse President Obama is because he too is African-American, which is absolutely insulting to a man who has achieved what General Powell has accomplished in his life. Willard, as per usual, is employing dubious “facts” in his most recent ads, which he’ll claim to have no knowledge of. For example, his new ad claims Chrysler is moving Jeep jobs to China. One reporter said the mendaciousness of Romney’s new auto ad is breathtaking even for him. Apparently, he’s utilizing his lying for the lord doctrine of his Mormon cult as his principle campaign strategy. For some reason unbeknownst to me, the American people seem to be perfectly okay with his mendacity and lack of resolve to maintain a position. Just wait folks. It is only going to get worse. The election is only eight days away and the GOP will break any law, commit fraud, lie, cheat and steal their way to victory. This time, we are far more prepared than we were in 2000 and 2004 when we never suspected the fraud the GOP will engage in to rig an election. Hopefully, America has acquired a sufficient distaste for outright lies and deceit. Next Post Romney apparel made in China, Obama’s made in the USA. Thanks for another fine post Jessie, as I enjoy what you write about, and have learned a lot, especially about Mormons. I thought I knew a lot, but I realize I didn’t. Keep up the great work as always! Great post, like always! Read them all, and you’ll be the wiser for doing so! I e-mailed this particular article via my “Old Timer” bulletin to about 150 people, including you, Jessie. You are like fireworks on a 4th of July night!